I was/he is/she is ‘In The Zone’. We’ve all heard the term – used most often in an athletic context – but what exactly is ‘The Zone’? And how does one get there- and stay there? All three questions are addressed in this second installment of Disc Golf in a Vacuum. If you haven’t read Part 1 of Disc Golf in a Vacuum yet, it recounts how I discovered (or maybe re-discovered is more accurate) the primal essence of what is most compelling about disc golf: controlling the path of a flying disc. More importantly it explains why that realization also enlightened me to the fact that true enjoyment and contentment playing disc golf can and does exist in a ‘vacuum’ totally void of things like score, player rating and luck. 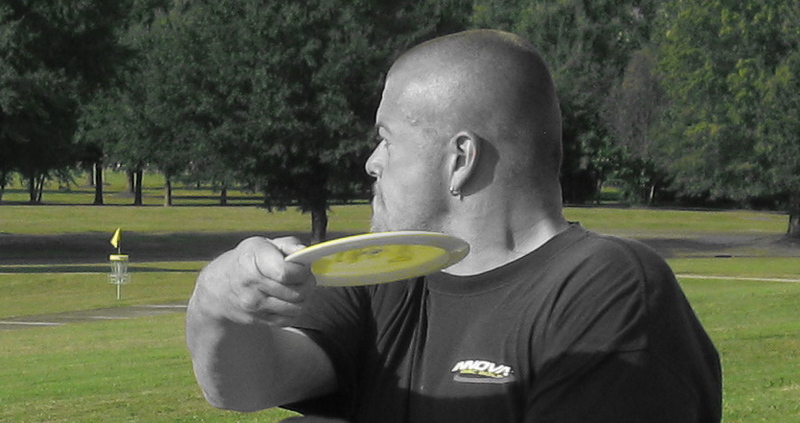 For some, that alone is enough reason to embrace Disc Golf in a Vacuum. But others – myself included – enjoy competing against others and the course, and have a genetically coded need to measure performance and results. To this group I’m happy to say that playing Disc Golf in a Vacuum most likely will also generate better scores in addition to a better experience. That, friends, is what is know as having your cake and eating it too. Or maybe in disc golf terms, having your collectible first run night shift Destroyer and throwing it too. And that brings us back to being In The Zone. First of all, I think everyone understands that being in the zone is a good thing. Someone who is in the zone while playing disc golf is throwing all her shots exactly as intended, and nailing all her putts. She is playing at the absolute peak of her abilities, and intensely focusing on each shot seemingly without any conscious effort. When I did a Google search using the phrase ‘definition of being in the zone’ the most relevant result was a Wikipedia entry for a psychological term called flow. The concept was originally proposed by Mihály Csíkszentmihályi, who said “Flow is completely focused motivation. It is a single-minded immersion and represents perhaps the ultimate experience in harnessing the emotions in the service of performing and learning.” Sounds like being in the zone to me. Japanese martial artists are said to sometimes achieve ‘mushin’, translated in English as “no mind”, which sounds like much the same thing. Ken ‘Tank’ Franks focuses on reaching the basket 415 feet away. Photo by Jack Trageser. Reading descriptions of both flow and mushin made me realize that those terms as well as ‘in the zone’ are all pretty accurate (and similar) descriptions of what I experienced during that round described in Part 1 of this series. There was the pure joy in what I was doing, the lack of anxiety connected to expectation or results, and most relevant to Part 2, heightened performance (despite the lack of emphasis on score). So – no big surprise – what I termed Disc Golf in a Vacuum is nothing new. But it was good to see that there is agreement on the best ways to get In The Zone and stay there as much as possible. Achieving the state of flow/In The Zone is desirous for many reasons (again, see Part 1), but right now we’re focusing on only one; improved performance. However, there is a paradoxical relationship at play that mades this a hard concept to grasp. Optimal performance levels are attained when one is In The Zone, but to get in The Zone one cannot be focusing on or even thinking about performance as it is typically measured. That is the reason Csíkszentmihályi chose the term flow and it’s why the word vacuum seemed most apt to me. It represents the state of total immersion in the moment, which in disc golf means thinking of nothing but the upcoming shot. Reduced to that throw and only that throw, all value in terms of scoring is stripped away and what is left is the simple desire to make the disc do exactly what you want it to do. And the focus can’t even be on the hoped-for flight, because that is also a form of measuring performance. Instead, conscious thought must be reduced to what needs to be done to achieve the desired outcome. Thoughts of the outcome itself – and this is really the key – can’t possibly exist In the Zone. Ideally we can get to the point where we have no conscious thoughts in this state at all (“no mind”, and in the Japanese mushin), but that is easier said than done. It’s practically impossible while playing a game as social as golf. However, I’ve discovered a few tactics that at least give me a better shot, and get me back on track when my mind wanders in the wrong direction. The most specific of these is to not keep track of score- or at least remain as much as possible in ignorance of the current total score during a round. It was hard for me at first, but whenever that thought came up I’d just try to think about something else. Now I’m at a point where towards the end of a round I won’t have any idea of my exact score- even though I use UDisc to record all my scores. I’ll enter the score for the hole but not look at the total (which thankfully in UDisc is in a smaller font). By the end of the round I’ll usually have an idea of how I’m doing within a couple strokes, but not knowing the exact total makes a big difference in keeping my mind on just the shot at hand. I think more than anything else it provides a specific framework (objective: be uncertain of total score by the end of the round) for the more important goal of not thinking about score during the round. And even before using UDisc, I never had trouble recounting my score on each hole after the round. By focusing intently on each shot, every one was clearly imprinted on my memory. That hasn’t always been the case. Another exercise that was difficult for me at first but came to be fairly natural (most of the time) is controlling emotional reactions to the results of throws. At first this meant not letting any kind of emotion show outwardly, regardless of whether I was seething inside over a bad shot or bad luck, or pumped up about something good. Even though I wanted badly to let it out, I’d just take deep breathes until it passed, and remind myself that the next shot was all that mattered now. After awhile, I noticed that the ‘zen-like’ non-reaction became natural, and my thoughts would be more reflective, detached and inquisitive (as in, ‘hmmm, what just happened there, and why?’) rather than reactionary and emotional. Finally, I just keep reminding myself that when it’s my turn to throw any thoughts other than those required to properly execute the shot need to be expelled. If I’m lining up a putt and start thinking of how much I need this birdie, or standing on the tee and focusing on the tree I sometimes hit – and am able to recognize those thoughts as the impediments to proper execution that they are – I will step back and use a visualization technique to remove that thought and get back on the proper track. The key of course is realizing the presence and harmfulness of that wrong thought before taking the shot, and doing something about it. Seems like we always recognize those after the shot, right? Nabbing and removing them beforehand takes practice, but stick with it and it’ll become more natural. My favorite visualization technique for removing those rogue thoughts, by the way, is a squeegee that wipes the slate clean, enabling me to start fresh. Ideally I’m in that state of flow or mushin where my disc golf game is on autopilot and I’m not conscious of any thoughts. But in reality Disc Golf in a Vacuum is more of an objective- a place to steer back towards when I get off track. Being In the Zone for any prolonged period of time is pretty rare. But I see it as a target, with The Zone being the bullseye. Most of the time the best I can do is make sure I stay close to the center of the target by using the tactics listed above. At the end of the round, I gauge my performance more on how well I played Disc Golf in a Vacuum than how I scored- but there is usually a close correlation between the two.